Lady Nell is a Washington state steel crab boat out of Westport built in 1988. A 54′ boat was brought to Commodore’s Boats with the purpose of adding sponsons. 10′ to be exact (5′ each side which increased the beam from 19’6″ to 29’6″. For a fraction of the cost of purchasing a new vessel and license it makes economical sense to widen the boat in order to create a near double deck space which accommodates many more crab traps and a safer, larger working area for the crew. The sponsons also allow an opportunity to increase fuel and water capacity through additional tanks and not to mention a larger fish hold. All combined the sponson project increases stability, performance which equates to a quick return on the owners investment. In some cases the investment can be paid off in just one season. In addition to the sponsons being added to this vessel, Commodore’s Boats added in a new bulbous bow and hydraulic thruster. The new bow was added to enhance performance, speed and fuel efficiency. The bulbous bow can be filled or emptied with water ballast to achieve the desired trim of the vessel. 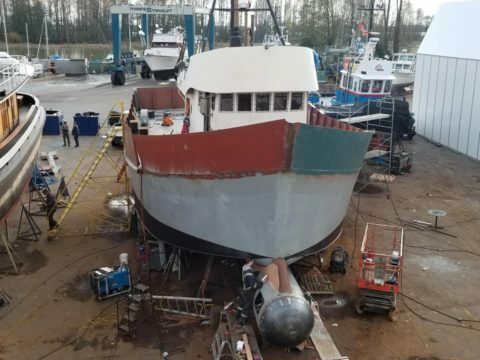 Commodore’s Boats is quickly being recognized as an industry leader in this type of project and are currently booking projects of this nature for 2019 and 2020. Although traditionally known as the wood boat experts of the Pacific Northwest it is clear by this video and project that we are much more. We have a separate metal/fab shop on site and are comfortable with both steel and aluminum as it relates to sponson projects. Our fiberglass shop is also more than willing to take on glass fiberglass repairs or sponson projects.